Well, the saying goes, "When in Rome, do as the Roman's do" but why not do as the Roman's do as often as possible, if not all the time? Ancient Rome was one of the most powerful and feared empires throughout all of history so we'd argue that one should do as the Roman's whenever he or she pleases. You can get down their style of cooking and the language later but we think that a great place to begin your Romanization is with your sense of fashion. 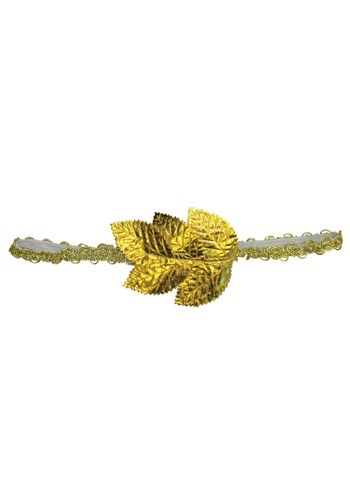 Try adding this Gold Leaf Roman Headband to your daily attire. Instantly you will feel as mighty as Rome's most respected Commanders after a victory in battle and as powerful as the members of the Roman Senate It can be a perfect subtle addition to any weekday outfit when you can't go full on Roman because your workplace won't allow togas. Otherwise, this delicate headband can also be the lynchpin holding your entire Roman costume together.